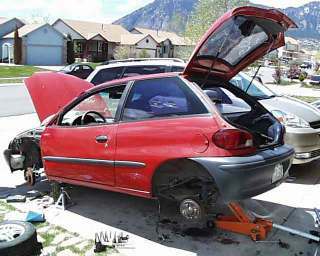 My Geo Metro Project page. . . He ended up crashing the car into the curb and side-swiping a post. Damage done: 3 cracked alloy wheels, front quarter panel smashed, driver's side door smashed, front/rear struts bent, front arm bent, rear arm bent, rear crossmember crushed. I went to the junkyard and spent $108 buying all the replacement parts needed to make it look (almost) new again. My goal is to make the metro get the highest mileage possible without sacrificing driveability/comfort. That means I am not going to gut the interior to save 20lbs in weight :-).